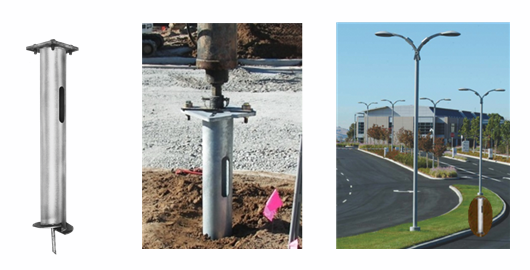 Our light pole foundation anchors are a quick and reliable foundation method for at grade and above grade applications to support street, site and parking light poles. The light pole support anchor systems are installed with hydraulic rotary equipment that turn the foundation in to the ground with the assistance of a helix shaped plate that acts as a screw for ease of installation to them. Helical anchors are used for new construction and to support existing structures. They are designed for applications in expansive soils, high water tables, fill areas, and other areas where unstable soils require a deep foundation. In compression they are used as footers and in tension they may be used to support retaining or foundation walls. Helical piers are round or square, tubular or bar steel shafts with round helix plates welded to them. · Helix Blade: 8", 10", 12" and 14" in diameter with 3/8", 1/2" thickness. · Length: 3ft, 5ft, 7ft, 10ft and other lengths according to customers' demand. · Finish: Plain, Hot Dipped Galvanized, Painted are available on your request. · A time-proven, versatile, and technically sound system. · Installs quickly with small or handheld equipment. · Can be installed in limited-access areas or tight access. · Site cleanliness and minimize damage to landscape. · Soil load bearing capacity is tested during installation. · Helical anchors available with single, double and triple helix blades.